Dates for 2020 will be selected soon. To be added to the workshop notification list please click here. 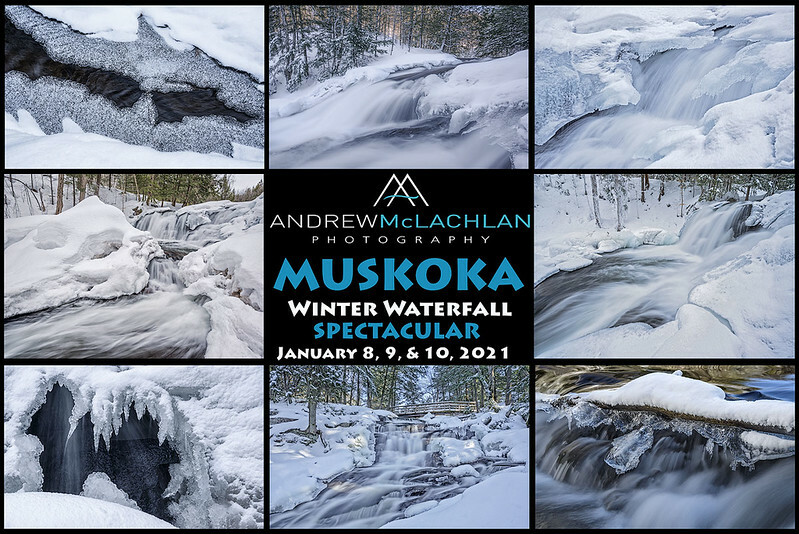 Join Andrew McLachlan in Ontario’s Muskoka District on February 8, 9 & 10, 2019 for one full day and two half days of in-depth photographic exploration of the finest waterfalls in the region. Embrace the beauty of Muskoka this winter and learn the skills of landscape photography amid a winter wonderland of snow clad, iconic white pines and the intricate ice formations that adorn the waterfalls and rivers. This workshop will require the ability to walk approximately 1 kilometre over uneven, snow-covered terrain. I do recommend the use of crampons on this workshop for the added safety they provide against slip and fall incidents if conditions are icy. I recommend that participants book their accommodations with the Sleep Inn in Bracebridge as they serve a continental breakfast. •	Stop for lunch at approximately 1:00 p.m.
•	Dinner at local restaurant at 7:00 p.m.
•	Stop for lunch (on your own) 1:00 p.m.
Payment can be made via email transfer or by cheque. A Waiver of Liability will be sent to those that are registering. A signed copy of this waiver must be returned to Andrew McLachlan in advance of the workshop. To reserve your spot in the Muskoka Winter Waterfall Spectacular please contact me by clicking here to arrange payment. Check your schedule carefully prior to booking.